Note: The following is the first installment of a three-part series on the Marimekko chart by Tableau Zen Master Jonathan Drummey. Tableau 10 gives you precise control over the width of your bars, enabling this new chart type. The Marimekko design firm of Helsinki, Finland exemplified the exuberant and colorful design style of the 1960s. The firm’s vivid fabrics and furnishings were a favorite among the decade’s bold and beautiful. In 1960, Jackie Kennedy campaigned for her husband, John, in Marimekko dresses. The Marimekko style remains popular to this day in design and, you may be surprised to learn, in data visualization. A Marimekko chart is a two-dimensional stacked chart of stacked, contiguous bars—looking somewhat like a Marimekko fabric. Marimekko charts combine visual pop with information. The eye captures two levels of information as it admires the colorful pattern the chart creates. We’ll call it Marimekko because that’s a common name in the Tableau world, though mosaic plot is the more widely-used name. I suspect that the reason Tableau users have wanted this chart since 2009 is that it combines multiple variables of data into a single rectangle of a plot. And “chunking” likely feels more efficient, even when it creates a more complicated graph that requires explanation. Let me tell you a story using a famous example of Simpson’s paradox (also known as the Simpson-Yule effect). Briefly stated, Simpson’s paradox is where a trend appears in one direction when we look at the data as a whole, and then the trend reverses direction when we look at groups of the data (or vice versa). 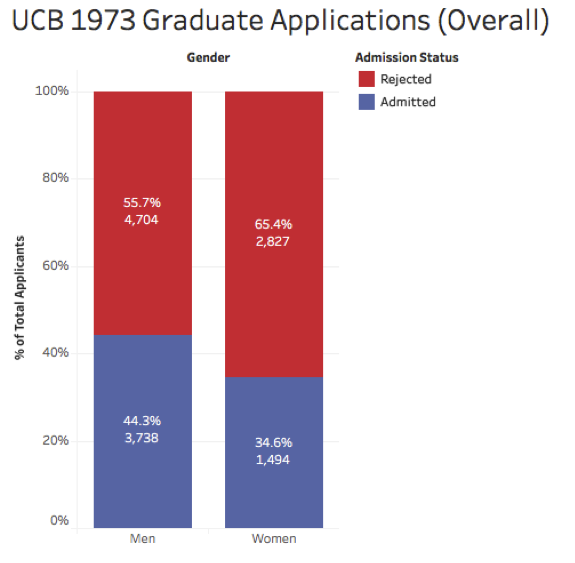 A group of UC Berkeley faculty and staff obtained detailed admissions data and came to a different conclusion. The group's famous paper concluded that at the department level, there was a small but significant bias in graduate admissions in the opposite direction toward women. 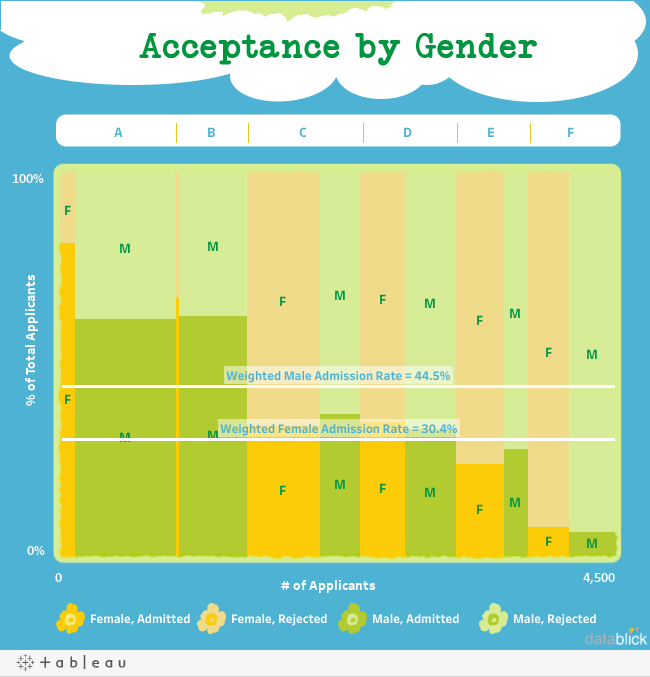 There are many more men than women applying to departments A and B, and that is weighting the results. 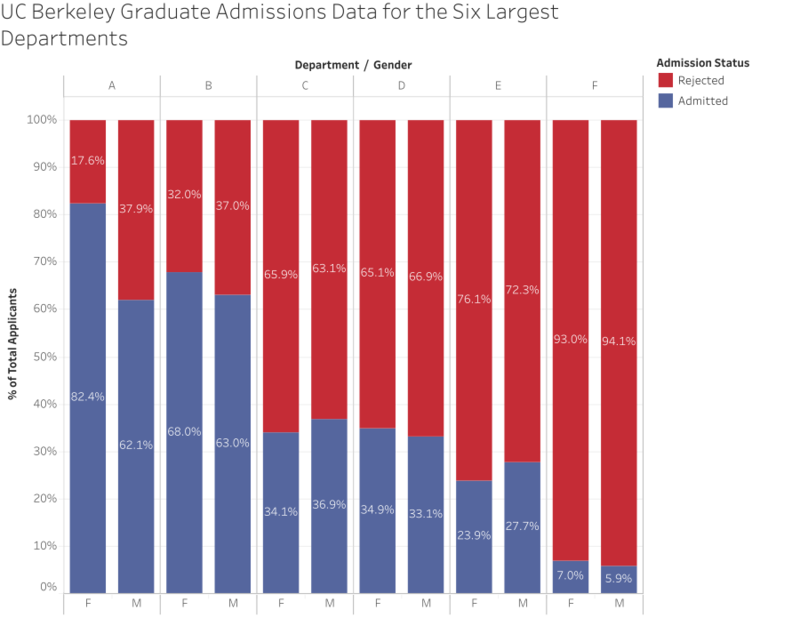 Seeing the relationship between the number of applicants and admission rate in two separate charts is harder to tease out. This is where the Marimekko plot can come into play since it lets us display both measures at once. With the Marimekko plot, the weighting that creates Simpson’s paradox becomes really apparent. 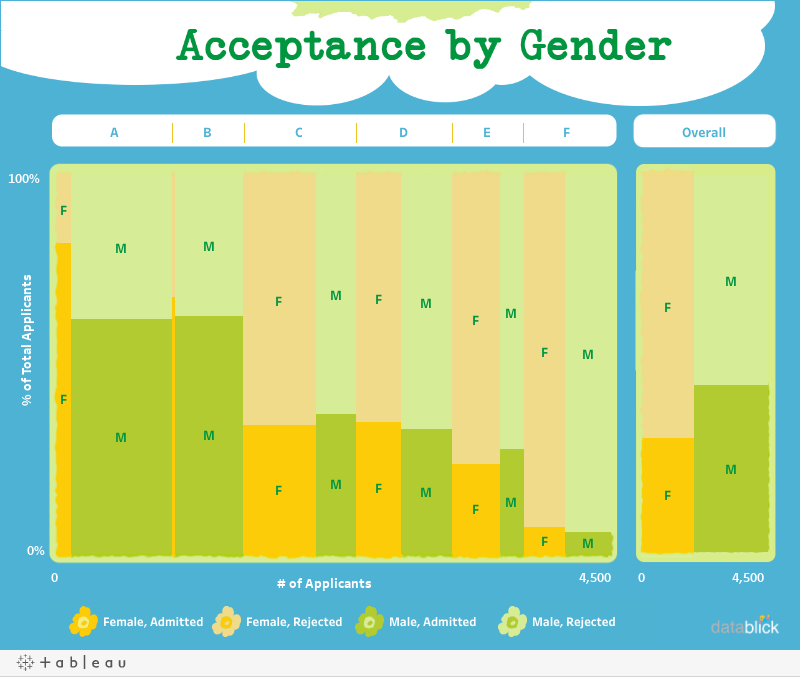 In departments A and B, there’s a high admission rate for both genders and a much larger proportion of male applicants. 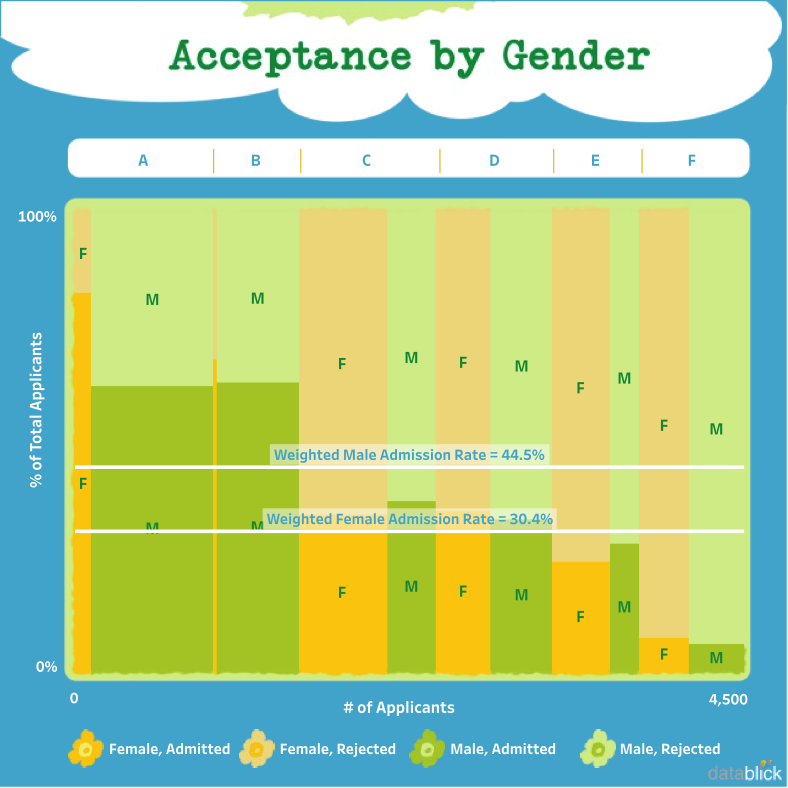 That effectively pulls up the overall admission rate for men while in other departments, there’s a lower admission rate for men and a more equal proportion of male and female applicants. Now that you know what a Marimekko is and when it’s most useful, it’s time to start building in Tableau 10. In the next installment of this series, I’ll share the steps to building a Marimekko chart in Tableau. And in the final installment, I’ll cover some alternatives to Marimekko charts that are easier to build. When he’s not writing Tableau tutorials, Jonathan Drummey offers Tableau consulting and training at DataBlick. He is also a Tableau Zen Master and authors the @helpmedatablick Tableau tip of the day.